Oxford celebrated National Flash Fiction in style with its first ever Flash Slam (http://eightcuts.com/events/flash-slam/), which showcased this fabulous format with some of the performance and pizzazz of a poetry slam. Fourteen fabulous writers came from as far afield as Birmingham, Bristol, and Gloucester, and included the likes of Jonathan Pinnock, bestselling author of Mrs Darcy vs the Aliens (http://www.mrsdarcyvsthealiens.com/), and Gloucester poet Laureate candidate Sarah Snell-Pym (http://www.snell-pym.org.uk/sarah/). They each performed for four minutes to a packed Albion Beatnik Bookstore, and subjected themselves to the scrutiny of expert judge and our headline reader Tania Hershman (http://www.taniahershman.com/), one of the UK’s most celebrated flash fiction writers, who delighted us later in the evening with readings from her book My Mother Was an Upright Piano. They were then scored out of 100 by a panel of judges comprising Paul Askew (http://paulaskew.tumblr.com), poetry slam winner and editor of Ferment Magazine, author of short story collection Knowing Look Rebecca Emin (http://ramblingsofarustywriter.blogspot.co.uk/), and leading Oxford cultural blogger Ingrina Shieh-Carson (http://aicarson.wordpress.com/). All presided over by yours truly. The top three performed again in a final that demonstrated perfectly the dazzling diversity of the form. The pieces that got them there couldn’t have been more different. Joe Briggs (http://somedaysthethundergetsyou.blogspot.co.uk/) is a music blogger whose semi-autobiographical pieces have the energy and edge and sense of imminent eruption of those underground punk gigs you heard about but never seemed to go to. Anna Hobson (http://makewordsnotwar.wordpress.com) is one of the leading figures in the Oxford literary scene, coordinator of poetry (and many other things) at Oxford International Women’s Festival and MC of spoken word at Oxford Pride. Her first round flarf (an alternative form of literature achieved by pasting quotations from the internet into a formal structure) was the highest scoring piece of the night by a long long way and it took the audience several minutes to regain their composure after her exquisitely-crafted and breathtakingly delivered look at the strange world of internet dating. But the winner, fittingly, was Bristol’s Kevlin Henney (http://asemantic.blogspot.co.uk/), an award-winning die hard practitioner of the flash form who married superb storytelling with effortlessly engaging delivery to carry off the spoils. I should add a postscript that shows just how successful this whole endeavour has been, and illustrates the debt we all owe to Calum and NFFD. On Wednesday of this week, I took a troupe of my fabulous eight cuts gallery regulars to the Poetry Cafe to perform at London Literature Lounge. Anna reprised her flarf to equal acclaim, and we were joined by Marc Nash, master of flash (sorely missed on NFFD). Literature Lounge host Anjan Saha was so buzzed by the vibrancy of the flash community that he and I will be running a flash slam at the Poetry Cafe on September 19th. And that’s not all. Thanks to NFFD, the Warwick Words festival organisers got in touch with me and have asked me to put on a flash slam for their festival, on October 4th. The format will be the same as Oxford – only this time our judge and headliner, for his sins in Oxford (and he thought he was just coming for a jolly night out), none other than Kevlin Henney. So, thank you all who took part. A special thanks to Tania, and our judges on the night. And biggest thanks of all to Calum – new worlds are opening up. We advertised an evening with an Open Mic, reading, writing and whatever came along, with a film of the event to end it off. The results came be seen on https://vimeo.com/42253978. The Shrewsbury Coffeehouse was full. For tablecloths we had lining paper and left pens about. People arrived saying they hadn’t brought stories to read – they’d just come to listen - but as the evening progressed and others went up to the Open Mic, just about everybody began to write. We had individual stories and collaborative ones, friends making up stories together [anything between ten words and five hundred] and strangers coming together to share their imaginations and have a go at flash, then get up and read it. People left in a state of high excitement. Apart from the flash itself, they found the evening an amazing experience of coming together and breaking down boundaries. They’ve been talking about it ever since. People are now writing who weren’t before. Visit us on our Facebook page, Flash Fiction Shrewsbury 2012. Or watch our film. Well, can you believe that a week has already come and gone since National Flash-Fiction Day? How time flies! I thought I would send out this bulletin to bring you up to date, let you know what happened, what's happening, and what's going to happen, and generally set you on your way. Gavin Inglis for the Edinburgh event, Brindley Hallam Dennis for Carlisle, Wes Brown for Leeds and Denise Sparrowhawk for Hartlepool. Thanks also to all of #FlashTag - Sarah-Clare Conlon, Fat Roland, Dave Hartley, Tom Mason and Benjamin Judge - for flash-bombing the whole of Manchester, and to Dan Carpenter, Nici West and Joe Daly of Bad Language for the Manchester evening event, as well as Jane Bradley at For Books' Sake for the workshop run there. I must also thank Mike Morris for Liverpool's End of the World event, Carole Burns for organising the Cardiff event and Emma Corfield-Waters from Book-ish for the Abergavenney one; Pauline Fisk and The Shrewsbury CoffeeHouse for the Tuesday event which started everything off, Dan Holloway for the Oxford Slam, and also Grit Lit in Brighton for linking their event up with us. Thanks also to Valerie O'Riordan, Emma J Lannie and Josephine Corcoran for running flash-workshops on and around the day, and many thanks to Angela Hicken from Winchester Discovery Centre and Allison Kirby from Southampton Central Library for their help with the workshop and reading/launch that I organised down here, as well as to everyone who came and read, wrote or listened. Thanks to Rebecca Emin, Ian Hawley, Dan Holloway (again), Kirsty Logan, Helena Mallett, Marc Nash, Alison Wells and (eventually!) Simon Sylvester for making their e-books free for us to give away. And also thanks to Rachel Carter, Bad Language (again), 4.33", Book-ish (again), Antonia Bell, Sarah Hilary, Jane Brunning, Natalie Bowers, Vic Errington, Susi Holliday and Anna Meade for running such wonderful competitions in the run up to the day, and producing, in some cases, such beautiful anthologies, and of course thanks to Valerie O'Riordan (again) and her partner Andy Broadey for helping to put Jawbreakerstogether and make it look so darned good! And (nearly done...) to Alex Thornber, Rachel Dunlop and Emily Cleaver for running http://nffdflashpoints.blogspot.co.uk/ and to Susi (again), Shirley Golden, Nettie Thomson, Cassandra Parkin, Susan Howe and Caroline Kelly for helping me to run http://flashfloodjournal.blogspot.co.uk/. And a personal thank you to Kath Lloyd who kept me (reasonably) sane through the mammoth process of running the day and did a lot of behind the scenes work. I know I've left loads of people out, but in lots of cases I don't know your names! So a huge, huge thank you to everyone who wrote something, read something, listened to something, came along to something, passed the word about something, or just generally sat at home with a cup of tea and supported the efforts of National Flash-Fiction Day! Okay, Oscar-acceptance speech over, onto the nitty gritty! First up, just to let you know that there are still competitions on the Competitions page and events on the Events page of the website (including my own appearance at the Worcestershire Lit Fest, do come along), so don't forget about those. And, if new 'flash' events or competitions come your way, do send them over. The website is not going to just disappear now the day is over, it will change a bit and we will not be updating quite so often, but we'll still be here and still doing our thing, so don't forget us. Next, I want to mention the free e-books that we gave away. Apologies, first, for those of you who tried to download Simon Sylvester's 140 Characters only to find it wasn't free. Apparently there had been a glitch somewhere in the process and a switch didn't get thrown. I did try to let people know through the Facebook page, but only had limited internet access so couldn't get to the web-page to alter it. The book was listed as free the next day, so hopefully some of you caught it then. On the subject of the books, however, it appears that around 150 people downloaded each of the books, which is wonderful, but the giveaway only works to support the writers if you spread the word. So, if you have read the books and you enjoyed them, please do go back to the Amazon pages and click on the 'Like' button up near the top, and also please leave a review to tell other people why they should buy copies with real money. Also, if you run a blog or website, please do consider writing reviews of the books there, or putting up a link to the books, or similar. One of the best ways to support a writer is to recommend their work. Thanks. A quick mention, as well, for the mooted anthology collecting together the winning entries from the various competitions. This is still on the cards and will be called 'I Can Show You The World and other stories' and will be out soon. It will be a free e-book available (probably) from Smashwords, so stay tuned for that. Having mentioned books, I should mention Jawbreakers. The e-book is now available on Kindle at http://www.amazon.co.uk/Jawbreakers-ebook/dp/B0083BRYKW/ref=sr_1_1?s=digital-text&ie=UTF8&qid=1337333761&sr=1-1 for you to download and enjoy immediately! Or you can still order real, physical, paper copies from us here at NFFD via http://www.nationalflashfictionday.co.uk/anthology.html. If neither of those take your fancy, there are copies for sale in Brighton's Waterstones (it would be great if they could sell out...) or you can come along to one of the launches we're organising for the book. We only have a confirmed date for one so far, but it is at Blackwell's in Manchester (by the university) on Friday 8th June at 6.30pm, so do please come along. More details here: https://www.facebook.com/events/429476600404131/. We are also now working on a Bristol launch, a Brighton one, and a London one, and if you'd like us to come to your area, do drop us a line. And so, onto the future. As you might have noticed above, I already alluded to the fact that the website will be continuing, so you have probably guessed that so will National Flash-Fiction Day. It's true. It went too well to give up. So plans are already being made for NFFD2013. But... we're not going to start just yet. Personally, I need a bit of downtime after all that hard work and excitement, plus I have lots of my own writing to do and - oh yes - I'm getting married in less than 6 weeks! So, the website will be tidied up, sales, events and launches for Jawbreakers will continue, and the occasional bulletin will trickle out, but I think we should all take a breather now until about September, at which point we'll pull the tarp off, put the key in the ignition and get the engine ticking over once more. Thank you for all your hard work, take a well earned break, but start thinking about what you'd like to do for next year, because that was just a trial run, next time we do it even bigger and better!! All the best, thank you again, and have a great summer. Following the events of last Wednesday - for which another hearty thanks should go to you all! - lots of people have been writing about what happened, what they did, where they went, and what they wrote. So, I thought they should be gathered together for you all to read. I'm sure this isn't exhaustive, but it's not a bad selection, I'm sure you'll agree! Don't forget, as well, the two special blog publications that came out from NFFD Central - FlashFlood, our 24 hour journal (http://flashfloodjournal.blogspot.co.uk/) and The Write-In which took place on the day (http://thewrite-in.blogspot.co.uk/) and, of course, the flashes which have been produced before,on and since the day on our Flashes blog (http://nffdflashes.blogspot.co.uk/). I love a good flash, me. Tiny complete micro stories of up to about 500 words. David Gaffney, a brilliant writer of flash fiction, writes about it here in the Guardian . Announcing our top 5 #FlashFiction contest finalists! Happy National Flash Fiction Day! … especially to the winner of our competition: Joy Manné! Enjoy her story and flash responsibly today. Members of a Manchester writinggroup are reading their work to unsuspecting passersby today to celebrate the first ever National Flash Fiction Day. VANESSA GEBBIE'S BLOG: NATIONAL FLASH FICTION DAY! National Flash-Fiction Day, dudes - but I'm just a teeny bit more excited about the launch of my chapbook, Enough, which is also today! I'm celebrating by, eh, feeding the baby porridge and paying my National Insurance bill. Oh, hell, yeah. Strictly Writing: What's my motivation? National Flash Fiction Day The internet tells me it was National Flash Fiction Day yesterday, in the UK. Well, it's flash fiction day here on Vapour Trails today. She's also the one who let me on that there was a National Flash Fiction Day. There are many others out there, and it's been a pleasure finding them, bit by bit. Tania Writes: Happy National Flash Fiction Day - And A Giveaway! ... who were too deeply engrossed in an old-fashioned book to be following the week's literary news, Wednesday was our first National Flash Fiction Day. Melanie Writes: Happy National Flash Fiction Day! HAPPY NATIONAL FLASH FICTION DAY! Although this is a UK based website, National Flash Fiction Day (#NFFD on Twitter) has gained traction worldwide. Pam's Writing Exploits: Happy National Flash Fiction Day! Happy National Flash Fiction Day! May 16 is apparently National (and International?!) Flash Fiction Day, so happy flash fiction day! To find out more click here. Thanks again – and happy National Flash Fiction Day! To submit a story, visit ... to like this post. This entry was posted on 20 May 2012 at 9:48 pm and is filed under Fiction Contests, Flash Fiction, Helpful Links, Literary Events, Uncategorized. 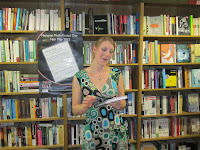 Author Ingrid JendrzejewskiPublished on 16 May 2012 5 Comments on Thank you and Goodnight! Well, that about wraps it up for this, the first ever National Flash-Fiction Day. I'm back from a wonderful launch at the Southampton Central Library where we had brilliant readings from Vanessa Gebbie, Sara Crowley, Tim Stevenson, Natalie Bowers, Gail Aldwin, Holly Howitt and, at the last minute, Bob Jacobs and Brendan Way. Massive thanks to them and everyone who helped out and who turned up! I've seen on Facebook and Twitter that you have all been having great flash-fun today at various events up and down the country (and around the world!) and I look forward to catching up with them over the next few days. If you ran an event and would like to send us a blog post about it, maybe with piccies, we'd love to run it! Thank you to everyone who has done anything for National Flash-Fiction Day. It has been truly amazing and you are all, individually and collectively, wonderful people.And thank you to the Arts Council who allowed us to do Jawbreakers and those wonderful cards and posters. And a personal thank you to my fiancée Kath, for all her help and support. It wouldn't have been possible without her. I will be adding new content to the site in coming days and weeks, updating blogs and generally catching up on the things that have gone by the by in recent days. Oh, and shipping out copies of Jawbreakers (still available to buy!) And we will be back with competitions, events and all kinds of flash-goodies throughout the year. Because, of course, we're building towards NFFD 2013 now!! So, well done everyone, thank you again for all you have done. I'm off to sleep for a week now, but I'll see you soon. 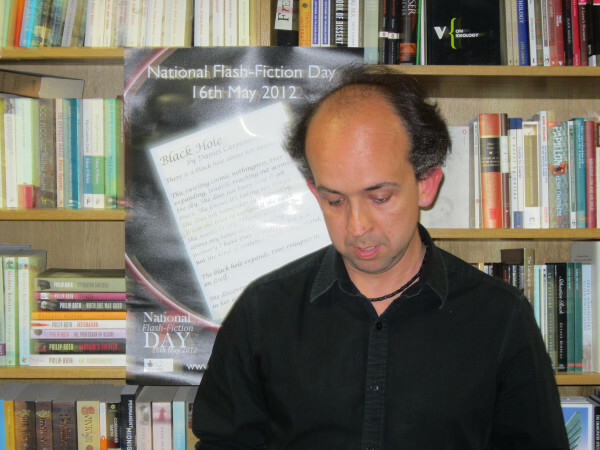 Director, National Flash-Fiction Day 2012. Published on 16 May 2012 Author Ingrid JendrzejewskiCategories News5 Comments on Thank you and Goodnight! As our contribution to National Flash Fiction Day 2012, run by director Calum Kerr, Flash Fiction World held a competition for stories built around a famous phrase. The response was fantastic and FFW thanks all entrants for their participation. Ever has it been that love knows not its own depth until the hour of separation by Lorna Louise Hutchison. The Day The Music Died by Iain Pattison. Every Picture Tells a Story by Francesca Burgess. Congratulations to Lorna, Iain, and Francesca. I will be in touch with you at the weekend. The winning stories, with judge's reviews, will be available to read on Flash Fiction World soon! Firstly, we’d like to say a big thank you to everyone who entered and promoted the #OUATWRITING contest. We had 88 fantastic entries and it was a huge struggle to pick just 3 of these as our winners. We had everything from evil Cinderellas to sci-fi to modern day tales and it was a delight to read them all… hence why we decided to publish them all in an anthology which will be available as a paperback and eBook very soon! As well as the individual prizes, the 3 main contest winners will be published in the National Flash Fiction Day Winners Anthology, which will be available soon – details to follow. The pair progress laboriously along the path in the park. He leaning on a stick, each step a pain, she almost bent double, hand in his. She clutches a paper bag. They sit carefully on a bench, very close, avoiding the damper spots. In front of them stretches a sea of pink bells. It is nine in the morning, and the bag contains croissants. Gertie hands one to Arthur. They nibble in silence, flakes fluttering like confetti. While a blackbird sings and sparrows edge towards the crumbs, Gertie extends a bent finger towards a plaque half-submerged in the flowers. ‘What does it say?’ she asks. ‘I don’t know,’ he says, because it is several feet away and his eyes aren’t too good. With a groan, she gets to her feet and shuffles towards it. Bent as she is, she still can’t make it out. She retrieves a pair of spectacles hanging round her neck, and peers closer. Arthur hears her saying something, but his hearing is not too good either. He sees her move forward among the flowers. As she does, she shrinks, smaller and smaller, until she vanishes into the pinkness. So he steps into the sea of flowers, and at once the pink bells inflate and grow until they are several times his height. The scent is overwhelming, the chime of the bells deep and sonorous. He walks towards Gertie and the others, praying that it doesn’t rain. A raindrop the size of a settee would be unsettling. But, he thinks, they must have ways of dealing with that. Back on the bench, a little breeze sweeps the paper bag off into a graceful dance, an homage, an obeisance, and all is still. Winners will be contacted via email about their prizes. Thanks again to everyone who entered - we hope you had as much fun with the contest as we did! Make sure you visit us at Yearning for Wonderland and SJI Hollidayfor more information about the anthologies. 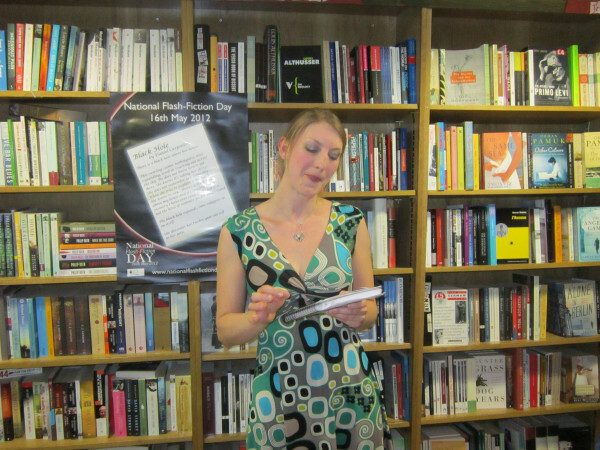 Author Ingrid JendrzejewskiPublished on 15 May 2012 5 Comments on The Day Has Finally Arrived!! Welcome, ladies and gentlemen, to National Flash-Fiction Day. This is what you have all been working towards, and I need to start by sending out a big thank you to each and every one of you for helping to make this day happen. Personally, I'm starting the day on the BBC Radio Solent Breakfast Show where they are going to give me a prompt to write a story live on air (eek! ), then off to Winchester Uni for the physical part of the write-in, then back to Southampton for the launch with Vanessa Gebbie, Holly Howitt, Sara Crowley, Natalie Bowers and chums. But in-between all that, I hope to keep up with you online and (now and again) in person. Thank you so much for pulling together and making this one (tired) man's dream come true! Now, get out there and make me proud. Happy Flash-Fiction Day to you all!! Published on 15 May 2012 Author Ingrid JendrzejewskiCategories The Day5 Comments on The Day Has Finally Arrived!! "Calum Kerr visited The Writers @ Lovedean on the 4th of May 2012. 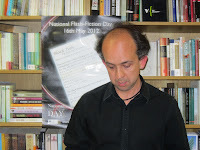 He spoke passionately about his flash fiction journey, and the 365 project which led on to National Flash Fiction Day. We as a group had an opportunity to listen to some of his work. After one of the best explanations of what flash fiction is, Calum gave the group an exercise to do. All of us present thoroughly enjoyed the exercise. We then had an opportunity to read our work aloud and receive that all important feedback. We as a group were so enthused by his presentation that we made a pact to write seven days of flash each until our next meeting. I have received so many positive comments from members about the event, and we have already asked Calum to come back next May to do an advanced flash fiction course with us." I hope you enjoy reading the stories as much as they obviously enjoyed writing them! Well, this will be the last bulletin before the big day, which is just TWO DAYS away!! There are, of course, competitions and things still going on over at http://www.nationalflashfictionday.co.uk/competitions.html and copies of Jawbreakers to order at http://www.nationalflashfictionday.co.uk/anthology.html and a range of the Kindle books we have listed on our site at http://www.nationalflashfictionday.co.uk/kindle.html will also be available throughout the day... for FREE!! And that's pretty much it. Things will be happening over the next day on the blog (http://nationalflashfictionday.blogspot.com/), website (http://www.nationalflashfictionday.co.uk), Facebook (https://www.facebook.com/nationalflashfictionday) and Twitter (https://twitter.com/#!/nationalflashfd), so stay tuned and spread the word. And here goes National Flash-Fiction Day 2012! !